Are you not getting any direction to improve your Content Management server performance due to publishing? Are you facing slowness while doing publishing or having publishing queue stuck-up issues? Separate Publish Instance is one of the solution. How to setup Sitecore Publish Instance? Sitecore PI is nothing but a clone instance of Sitecore CM environment. On CM server, open \Website\App_Config\Include\Scalability.config file. Update Publish Instance Name as below. If the value is empty Sitecore will use the instance name by combining the machine name and the IIS Site name. So for the IIS Site Sitecore on the server PI the instance name would become PI-Sitecore. Just to remember, do not configure above setting on Publish Instance. Note: Sitecore allows to add only one publish instance name in this setting. Enable EventQueue on both CM and PublishInstance servers. To enable EventQueues, from web.config, find EnableEventQueues setting. Set its value to true. This setting can also be set from \App_Config\Include\ScalabilitySettings.config, which will be given more precedence over web.config settings. Disable any scheduled tasks or agents running if not required. How Publishing works on Publish Instance? Below image shows the flow of publishing from CM to PI server. Suppose, Sitecore CM Application has Instance named Staging-Sitecore (In image: CM1), and Publish Instance is named PI-Sitecore (In image: CM-PI-1). Now, as per above settings, Sitecore CM1 knows that it's publishing should be done by Publish Instance: PI-Sitecore. Now, when a user sets a publish job, Sitecore adds its entry in EventQueue table with a flag/column of PublishInstance. It simply adds PI-Name in that column's value. So, every publish job is assigned its Publish Instance Name. 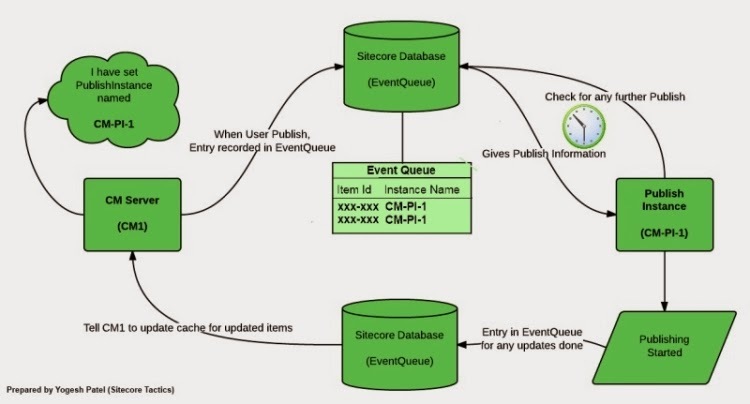 Now, as per EventQueue architecture every Sitecore Instance checks for EventQueue every few seconds to fetch which events/jobs it has to perform. Here, when CM1 server checks EventQueue, it will not find any publish job, where PI will find records with its name. So, it will fetch those publish details and start publishing those publish jobs. Now, as per architecture, all other instances will start updating cache of those published and related items, to get updated. Can we utilize Publish Instance for other tasks? - PI is not only PI, which can still be used as CM. So, we can have two Content Management servers. So, we can make less used CM as PI. - If we are using it only for Publishing, then we can reduce load of CM server by moving all backend tasks or jobs(except Sitecore default) to PI. How many instances Sitecore supports? Logically, unlimited. We can have multiple Sitecore Instances working as CM with/without load-balanced environment with one PI. As per Sitecore architecture, only one PI is recommended. But after reviewing publishing code and my experiements done locally, I concluded that we can have two PIs too. But, that will work with minor architecture change and only one limitation that an item can not be published on both PIs simultaneously. Yogesh - how did you implement multiple publishing instances? My customers freak out when they see a single point of failure in enterprise environments. There are two ways of using multiple publish instances. 1. Role specific publishing instance, market place module is also available for this. You can change the business logic as per your need to make it load balanced or for disaster recovery. Whatever publishing is done, it should not be sent to publishing directly. 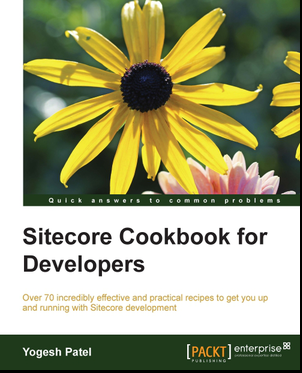 - Whatever publishing is fired, do not send it to sitecore. First add its details to your custom table along with PI name from where you want to publish. - Both PIs will be having a agent running, they will check if any publishing is available for them or not and start pubshihing from their side. This is really complex process to implement.